New issue of PhotoPlus: The Canon Magazine now on sale! 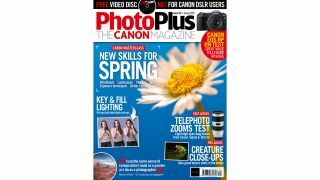 The new 151th issue of PhotoPlus: The Canon Magazine is on sale now – as well as arriving in subscribers' postboxes too. The Spring season brings many photogenic subjects; flowers and blossom on trees appear, birds and animals come back to life, and landscapes begin to appear more and vibrant. This issue, we’ll help you capture all of Spring at its best, from flowery woodlands to lush landscapes, close-ups of nature to birds in flight, we’ll help you master your Canon camera, lenses and kit to take best-ever Spring photos this year. Also inside this 151th issue, we arranged for our lucky PhotoPlus Apprentice, Robin, to fulfill her life-long photographic ambition to photograph large spiders, when we fixed a photography workshop with Miles Herbert from CaptiveLight. Along with a huge, hairy tarantula, Robin photographed tropical frogs and harvest mice up-close in his studio set-up. We interview maverick American landscape photographer Valerie Millett, who reveals his stunning portfolio, and the obstacles she’s overcome during her career to date. We have more fantastic photo projects and with free video guides in our full-to-bursting Canon Skills section; including how to use key and fill lighting for better portraits, taking two exposures of a high-contrast scene to merge them for better, balanced exposures and more dynamic skies, plus getting to grips with fisheye lenses. Don’t forget the accompanying video guides, on the disc, or web links on the pages for those who don’t have a CD drive on their machines. Plus we test Canon’s new, great-value EOS RP mirrorless full-frame camera, find out our honest verdict of this ground-breaking camera, and we test eight fast telephoto zooms from Canon, Sigma and Tamron. PhotoPlus: The Canon Magazine is 132 pages of essential Canon techniques, reviews, news and inspiration – out now at all good newsagents and supermarkets, or make sure of your copy every month by subscribing at our online shop from just £12.50 for three issues!